Developed by TT Games. Published by WB Games. Released February 28 2014. Available on PC, PS3, Wii U, Xbox 360 (reviewed). Let me start off by saying that if you haven't seen The LEGO Movie, you should probably stop reading this review and go see it before going any further. It's a fantastic, enjoyable film that features a great cast, an engaging story and is really hilarious to boot. 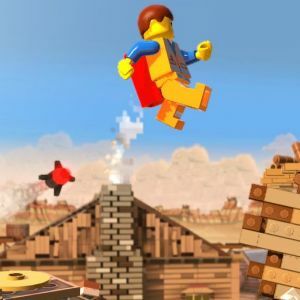 As a big fan of both the movie and LEGOs in general, I had high hopes for The LEGO Movie Videogame, especially since it comes from TT Games, the same developer behind LEGO Marvel Superheroes and the well-designed LEGO City Undercover. And while the game does have its high points, it doesn't quite live up to the LEGO games that came before. The LEGO Movie Videogame's story is loosely based on The LEGO Movie, going so far as to feature abbreviated clips from the film to serve as cutscenes in between segments. Just in case you haven't seen the movie yet (which you totally should, in case I haven't established this yet), it's about a regular, everyday construction worker named Emmet, who upon making contact with a mysterious relic known as the "Piece of Resistance," finds himself thrust into an adventure to save the world from the nefarious President Business and his plan to destroy the universe. Along the way he meets up with Wyldstyle and Vitruvius, members of a secret group of Master Builders who are able to fashion fantastic LEGO creations without the need for instructions. For the most part, LEGO Movie Videogame does an okay job of adapting the film's story into a 6+ hour long story campaign, but a good chunk of the charm and humor that was present in the film gets lost in translation. Much like TT's previous LEGO games, The LEGO Movie Videogame focuses on platforming action with several puzzles, secrets and collectibles scattered around each level. Many of the environments you'll explore are straight out of the movie, taking you to Emmet's hometown of Bricksburg, the dusty Old West and the rainbow-filled Cloud Cuckoo Land. The levels, all highly detailed and made out of LEGO bricks, have various objectives, from finding instruction pages so you can build something like a catapult to use against enemies, or smash apart other LEGO creations to build ramps, or ladders to help reach other locations. Unfortunately, it doesn't really feel like the game hits its stride until the mid-way point. Some of the levels have a tendency to be a slog to play through, especially some of the opening missions in Bricksburg and The Old West, and there are times where you'll get bored of punching waves of robots into pieces. In each level, you'll usually have multiple characters at your command, each with their own special abilities, and you'll need to swap between them several times each level in order to overcome the various obstacles in your way. For example, the acrobatic Wyldstyle is the only one who can both jump higher than other characters and crawl along certain wall segments, while 1980's spaceman Benny is able to hack into certain consoles to control robotic enemies (through a Pac-Man style minigame). Switching between characters is as easy as pushing a button, but can be a tad confusing at times when you've got as many as five characters on screen at one time and you're trying to select a specific person to handle a specific task. Some levels have sections you can't access until you've unlocked certain characters, which does offer up some incentive to play through previous sections of the game once you've picked up a character who can say, throw explosives or use lasers to get through special blocks that seal off secret areas. Unless you're a completionist, however, you might not feel like going through the whole game again just to gain access to a few extras. 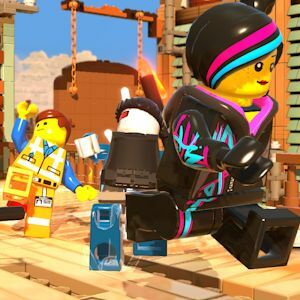 Bottom Line: The LEGO Movie Videogame is an okay game that LEGO fans will enjoy, but is missing some of the charm of the film and doesn't feel like it lives up to TT's other LEGO titles. Recommendation: If you didn't get enough of a LEGO fix from the movie, then check out the game, but you may want to check out some of TT's previous LEGO titles if you're looking for something more substantial.